History of Paul K. Guillow, Inc. The Guillow model airplane company had its beginnings as Nu Craft Toys in 1926. 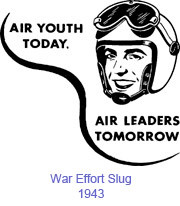 The company was founded by Paul K. Guillow, a World War I U. S. Navy Aviator. His experience as a Navy pilot kindled in him a great interest in aviation and eventually lead to the creation and marketing of a line of small balsa wood, shelf model construction kits of famous World War I combat aircraft. In 1927 Charles A. Lindbergh flew the "Spirit of St. Louis" from New York to Paris, France on the first successful solo flight across the Atlantic. National interest in all matters pertaining to aviation peaked. 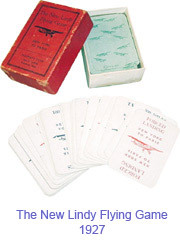 With that came the success of his card game "The New Lindy Flying Game" Paul K. Guillow found his model airplane kits in great demand. The company which originally started in the barn of the family home soon required a larger facility and subsequently was moved to the second floor of a service station in downtown Wakefield, MA. In 1933 his rapidly expanding business was again moved to its present day location at 40 New Salem St., Wakefield, MA. Then started operating under the name of Paul K. Guillow, the business sold its first shelf model kits to a national chain and was besieged with orders catapulting Paul into his role as a major player in the balsa model industry. The first line of Guillow balsa shelf model kits offered consisted of 12 different W.W.I biplane fighters with 6" wing spans that retailed for 10¢ each. Each kit contained a 3-view plan, balsa wood cement, 2 bottles of colored dope, a strip of bamboo for wing and landing gear struts, all in all a great value even in those distant days. For several years up to the mid 40's, this initial line of balsa shelf model kits sold well all over the country and, during the time, many more models were added including a line of 50" wing span models that sold for $1.50. Paul Guillow, as a recognized authority on aviation history, supplemented his production of model airplanes with the publication of four aviation books. His first in 1941, "Tom's Book of Flying Models" was followed by "Flying Models - How to build Them" in 1942, "Building An Airplane" in 1943 and his final "Flying Model Airplane Plans" in 1944. During the Second World War most of the balsa wood was being diverted for military use in the production of rafts and life jackets making it nearly impossible to acquire. 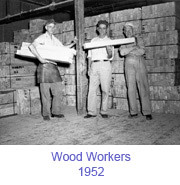 Balsa wood comes from Ecuador and the war effort and German U-boats conspired to make life difficult for balsa model builders. This did not deter Paul from supplying his customers with model kits. Anxious to build the new WWII aircraft Hellcats, Avengers, Mitchells, Mustangs, Messerschmitts, Stearmans, Corsairs and Lightnings model builders were forced to switch to paper cardboard and pine although not always successfully. Guillow also served the war effort by supplying the armed forces with a number of drone aircraft to help U.S. gunners sharpen their skills. Post war prosperity and the new plastic models caused a decline in the "stick and tissue" business. With plummeting sales in the kit business Guillow's concentrated on producing inexpensive hand launched and rubber powered gliders. 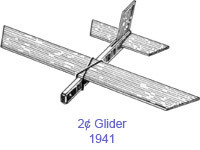 A dozen new gliders were merchandised in a large variety of attractive displays to suit the needs of all customers from the "mom and pop" stores to the larger department stores. 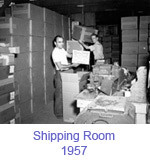 In the 1950's a resurgence in the demand for "stick and tissue" kits brought new prosperity to Guillow's. Paul K. Guillow passed away in 1951. His widow Gertrude H. Guillow incorporated the company and became both President and Treasurer. With the help of Paul's brother Roscoe and Earl Smith as officers of the company William Colwell production manager, Lou Andrews design engineer, they carried on Paul's dream. In 1953 the "Jetfire" glider was introduced as the first glider to be mass-produced and packaged on a high speed packaging machine. This new technology enabled Guillow's to keep up with the booming economy and place its gliders in the up and coming chain stores. As America's war veterans had children of their own, the baby boomers started to become model airplane builders. Guillow answered their call by producing hundreds of thousands of flying model airplane kits to satisfy their building and creative needs. As the 60's approached, Guillow's furthered their marketing by introducing many different counter and floor stand displays, using their vast assortment of hand launched and rubber powered toy planes. "I think that you have the lousiest planes made from the lousiest wood (please take this as an insult). If you make planes like that put extra parts in them so I can fix the broken, rotten, lousy, dirty, crummy airplanes... if your planes aren't better I will sew you for fraud. Sincerely, Robert Higgins... P.S. drop dead!" Fortunately, Guillow's has millions of loyal and satisfied customers and has received many complimentary letters over the years. Mrs. Gertrude Guillow retired as President in 1980 and was succeeded by Earl Smith as President. Retiring in 1983 Earl passed the gavel to Vice President William Colwell with National Sales Manager Alson Smith becoming Vice President. William Colwell retired in 1989 promoting Alson Smith to President and Thomas Barker and John MacDonald to Vice President. In 2009 Alson Smith returned to National Sales Manager and promoted Thomas Barker to the position of President. The year 2013 and 2014 brought many changes to the management of Guillow’s. John MacDonald moved on and Alson Smith retired. In early 2015 Ivan Resnick became Vice President of Sales. In the mid 1980's Guillow's diversified its business and entered into the promotional products industry by custom printing messages on the wings of inexpensive hand launched gliders. With the purchase of Tiger Incorporated in 1994, Guillows acquired foam products to enhance this division of its business. In early 1998, Guillow purchased long time competitor Comet Industries/North Pacific of Chicago. This purchase transformed Paul K. Guillow, Inc. into one of the worlds largest toy airplane manufacturers and created one of the most complete lines of flying toys available, as seen in the pages of this web site. Paul Guillow's dream still lives on in the company today as we continue to strive to keep young and old happily building and flying toy and hobby airplanes models. 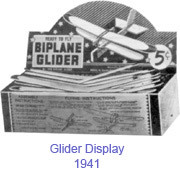 For the past 85 years nearly every American boy, girl and young at heart have enjoyed the inexpensive balsa wood gliders of the Paul K. Guillow Company. Sunny afternoons flying Guillow gliders have created fond memories and helped imaginations soar. In the past 85 years we have gone from "one mans dream" to a leader in the toy industry! With our continued growth we now have state of the art machinery and facilities to produce millions of planes a year !! We would like to thank you for your past support and hope to continue our relationship for many years in the future.